The future made possible today! A technologically sophisticated digital anesthesia CarestationTM that is both clinically advanced and intuitive to the touch. Advancements in digital technology are driving a new era of brilliant machines at GE. Aisys CS2 is a technologically sophisticated class of digital Carestation that also manages to be intuitive to the touch. Anchoring the Aisys CS2 is a sleek user-interface enabled by a 15-inch touchscreen display. The ecoFLOW display option provides a graphical representation of oxygen flow and anesthetic agent use that can show you your preset target and calculate the cost of your agent consumed in real-time. Clinicians use the information to adjust oxygen flow to maintain their desired inspired oxygen concentration and avoid unnecessarily high fresh gas flow rates. Modular and upgradeable, with Aisys CS2 you're planning for the future while protecting your investment. 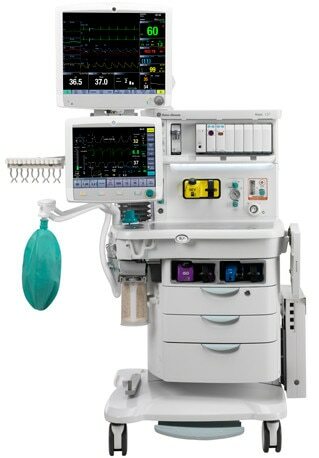 Aisys CS2 isn't just another anesthesia delivery system...and it's not just a Carestation...it's the future! And it's here today.